This insect group is a major pest of the dried fruit industry, although it will attack grain and grain based products, especially if the cereal product is damaged. This insect is also a serious pest of fruits in the field and can spread yeast cells and bacteria causing damage to the fruit before harvest. Adult dried fruit beetles (3-4 mm (1/8 inch)) are oval and black in color with two large conspicuous yellow-brown spots on the wing covers. Sometimes these spots run together to form one large spot. The corn sap beetle (2-3.5 mm (1/8 to 1/4 inch)) can be distinguished from the dried fruit beetle by the absence of the yellow-brown spots on the wing covers. The eleven segmented antennae are slender except for the last few segments, which are distinctly enlarged into a club. To distinguish the dried fruit and corn sap beetles from other beetles, examine the wing covers. If the wing covers are very short and you can see the tip of the abdomen, it is in the “sap” beetle family. The slender larvae are small (1/4 inch), white, with a light brown head and hardened projections from the end of their abdomens that are species specific. Eggs are laid singly, on ripe or fermenting fruit, in the field or in stored-products. Eggs take 1-4 days to hatch. Larval development is completed in 4-14 days. Pupation usually takes place in heavy soil in field populations, but in stored-products, pupation takes place within the infested commodity. In warm areas or within heated buildings, breeding is continuous and there are several generations per year. Pupation occurs after a prepupal period of 3-8 days, and adults emerge 4-16 days later. Thus, the development cycle is about 12 days at warm temperatures (32.2°C) and up to 42 days at cooler temperatures (18.3°C). When temperatures are too low for breeding, the beetles hibernate as mature larvae, pupae or adults in the soil, stored commodity, or fruit left on the ground. Though adults can live for more than a year, dried fruit beetle males generally live 146 days while females average 103 days. Corn sap beetle longevity was greatest at the highest humidity (134 days at 90% rh and 20°C and 75 days at 70% rh at 25°C). Larval stages are very active and will try to hide if disturbed. Adults are active during the day and night and although resistant to flight, can migrate up to 2 miles in 4 days. 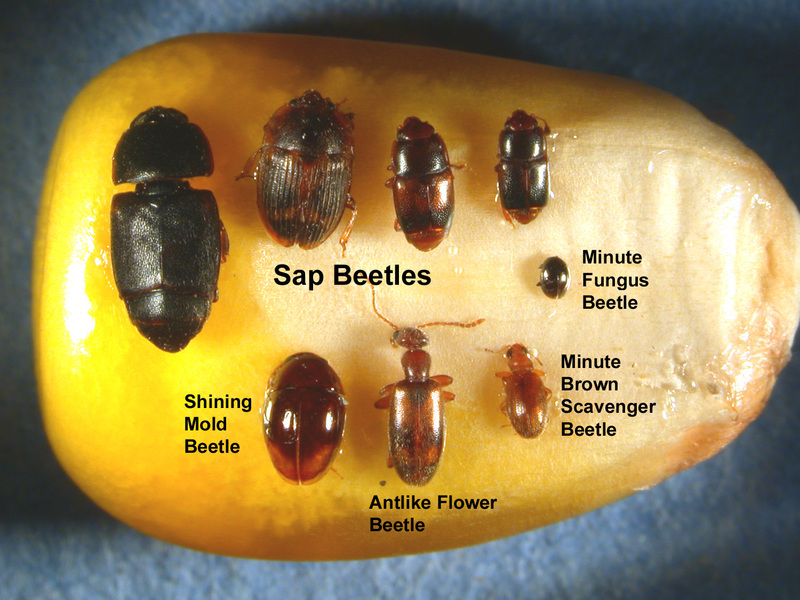 Adult sap beetles are drawn to volatiles from fermenting fruit and grains, thus sanitation is important in controlling these pests. Female dried fruit beetles can lay over 2,134 eggs at 28.1°C, however the average is 1,071 eggs in her lifetime. The pre-oviposition, oviposition, and post-oviposition periods are 3, 61, and 9 days respectively. Humidity is very important to the survival of dried fruit beetles while corn sap beetles, often found in rice, only require 10% moisture to mature to the adult stage (it prefers 15-33% moisture). Low humidity is unsuitable for dried fruit beetle larval development and oviposition. Larval development times increase with decreasing humidity so that the mean period from egg to adult increases from 19 days at 92% rh to 24 days at 66% rh. Humidity has little effect on the egg, prepupal or pupal stages. Usually there are four larval instars, however, as humidity decreases, the proportion with five instars increase. Oviposition is also effected by humidity; at 75% rh 1.5 eggs/day are laid while at 58% rh the rate diminishes to 0.1 egg/day. The corn sap beetle and dried fruit beetle can be found in a wide variety of ripe and decomposing fruit in the field and is a serious pest of dried fruit. The dried fruit beetle can also be found on stored corn, cornmeal, wheat, oats, rice, beans, nuts, peanuts, cottonseed, copra, spices, drugs, bread, sugar, and honey. 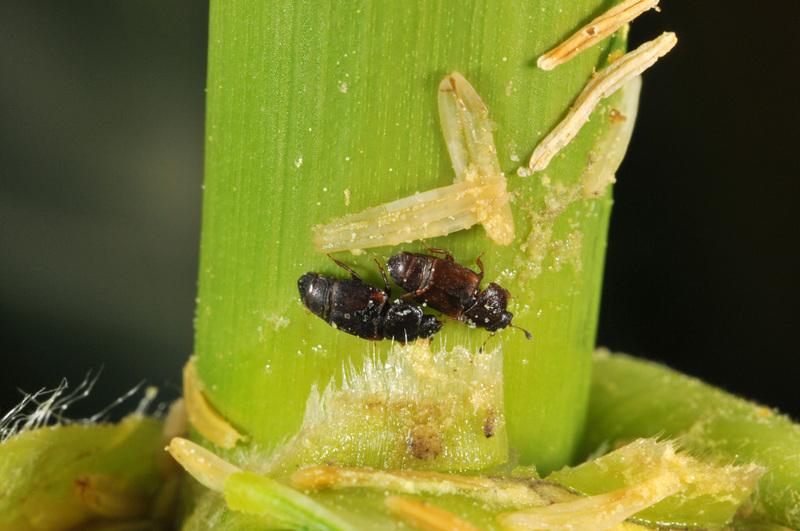 The corn sap beetle is most commonly found feeding on rice, wheat bran, dried fruit, or moldy food. General or spot application of a labeled residual insecticide may be used in fruit processing facilities. 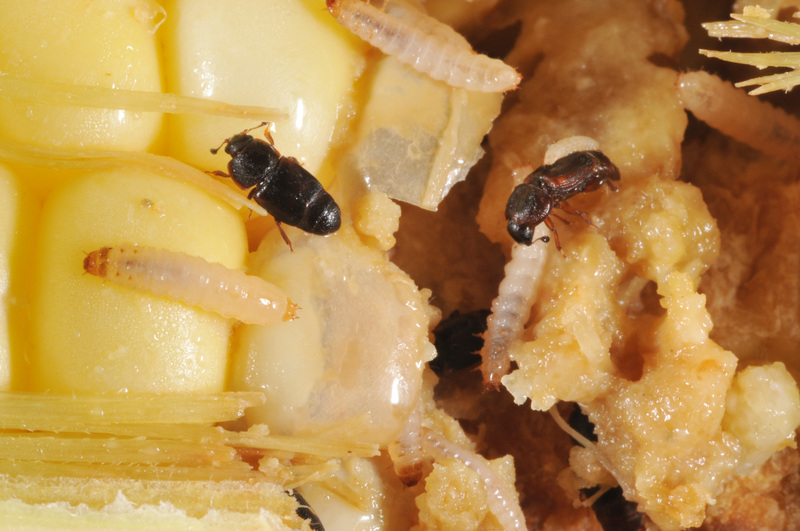 Immediate clean up of grain/food spills to prevent decomposition will discourage beetles. Dumpsters should also be cleaned regularly to prevent accumulation of spoiled products. In severe infestations, fumigation may be necessary.